Yes, it was at this point when I decided that Boys Over Flowers was about….well, the boys. I reached my wit’s end with Jan Di (I know, there is more frustration to come! ), but just as I was going to throw in the towel, SHE showed up. Oh, you heard whispers about her in earlier episodes, but she just busts on the scene in Episode 7. I’m talking about none other than Jun Pyo’s sister, Jun Hee. 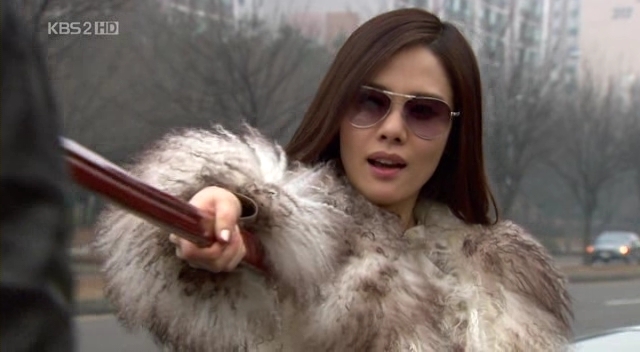 You can tell she’s Jun Pyo’s sister too: she gets out that car with her cool shades and her pimptastic fur. Clearly, the pimp aesthetic is strong with this family! I’m not joking, I was absolutely giddy to see her get out of her white car and hit Jun Pyo with her wooden sword (who keeps a wooden sword in their car? not that I know ANYTHING about that….). Jan Di is lucky she shows up; otherwise, we would have to depend on HER to fix the situation between Ji Hoo and Jun Pyo, and that’s highly unlikely to happen. Jun Hee treats Jun Pyo like Jan Di used to: completely not caring about his feelings but in a sweet way, roughing him up for fun. But I like the relationship between Jun Hee and Jun Pyo (violence aside), because it shows that there is hope that Jun Pyo can develop into a decent human being despite being warped by his evil mother. Jun Hee is strong, and when she tells Jan Di to fight, she doesn’t actually mean draw blood. I think she’s trying to give Jan Di the confidence to assert herself. As usual, Jan Di is all non-committal about the whole Jun Pyo-Ji Hoo situation (really, can’t lose with that). And it’s because of her that we have to endure a mini-triathlon between Jun Pyo and Ji Hoo. What good is it that you feel sorry NOW?! So we see the horse race, the car race and finally the swimming test. During the horse race, you do see that really aggressive side of Jun Pyo, but these bouts are becoming fewer and fewer, which means that he’s GROWING. Every time he has to encounter some situation that Jan Di finds herself in, he does grow and change as a character. She, however, does NOT! 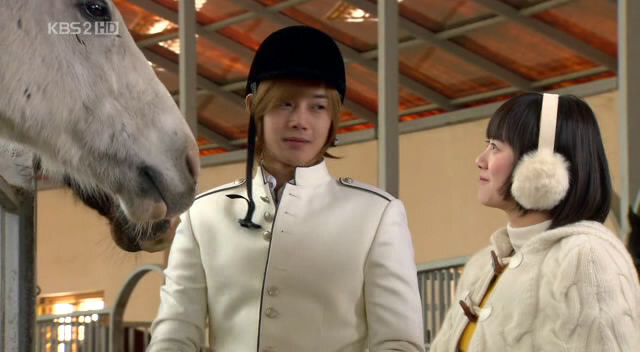 Completely unrelated note: I’m digging Ji Hoo’s equestrian wear! Are we supposed to draw some conclusions from the fact that he’s wearing white and Jun Pyo shows up in Johnny Cash black? I’m not trying to make light of Ji Hoo’s post traumatic stress syndrome resulting from his early childhood car accident, but don’t let “poor Ji Hoo” fool you. Dude did kiss his friend’s kinda-sorta girlfriend. At this point, I know a lot of people are feeling for Ji Hoo, the sensitive soul, who has only looked out for Jan Di, as opposed to Jun Pyo who has “terrorized” her. But Ji Hoo has allowed some stuff to happen to Jan Di, especially when she first starts at the school. And let’s not forget that he is a member of the same F4 that pushed dude to try to jump off the building in the first episode in the first place. He’s no innocent angel over there. I think part of him wants to beat Jun Pyo just because of years of resentment. He wants to get back at him, just a little. If so, once again, it’s all about the boys. I’m with Yi Jung on this one. Ji Hoo broke the rule of brothership, so he needs some kind of punishment, but probably not being kicked out of the group, banned from school, or, if Jun Pyo could make it happen, exiled from the planet. I think Woo Bin just wants everyone to get along so that he can get back to wooing the ladies. So at the end of the episode, Jun Pyo is still, in his awkward kind of way, trying to get Jan Di to understand how she messed up. Does she take this opportunity to make a grand apology? No. Explain what she was thinking. Uh-uh. Declare her undying love for Ji Hoo? Nope. She just stands there, like she always does. She has no idea that she not only kissed some random guy on a beach (making this viewer seriously wonder about her protests of innocence), but she kissed the ONE person in the world that she shouldn’t have. How in the world can she have hung around F4 and not understand that in their crazy rich world, they only have each other? And this is why I had to put Jan Di down. She never changes. She’s all self-righteous at the beginning, lecturing Jun Pyo about love, and friendship, and here she is messing with the one halfway normal relationship Jun Pyo has. She is clueless! What happened, Jan Di? So there she is, standing there, letting Jun Pyo hug her, playing the limp rag doll. Shoot. Me. Now. WBDS: Episodes 1-10, or There Are Two Things I’m Afraid Of…. Si! Todo es sobre los F4!! !